Order your Cross Century II 10KT Gold Plate Fountain Pen today from FahrneysPens.com. Fine Pens, Refills & Luxurious Gifts – great prices & fast shipping. 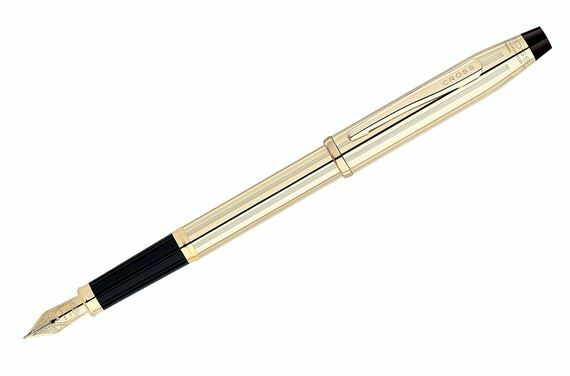 The Cross Century II 10K Gold Filled/Rolled Gold Fountain Pen is the modern version of the original Cross profile with a popular medium-diameter barrel, conical top and single cap ring. The 10K gold-filled/rolled gold finish is greater in gold content than gold plate and is a fine example of Cross' unsurpassed craftsmanship. The fountain pen has a 18K gold-plated nib and uses cartridges or converter. Converter not included.